An arrest warrant is now issued for Elena Alekseevna Khusyaynova of St. Petersburg, the recipient of the first midterm meddling charge from federal authorities. WASHINGTON – Less than a month after Donald J. Trump won the presidency, a Russian coterie run by “Putin’s chef,” and a chief accountant from St. Petersburg was far from finished with America’s elections. According to the U.S. Department of Justice, a December 5, 2016 Facebook post from the Russian group known as “Project Lakhta” targeted the American media, police shootings and racial fault lines. 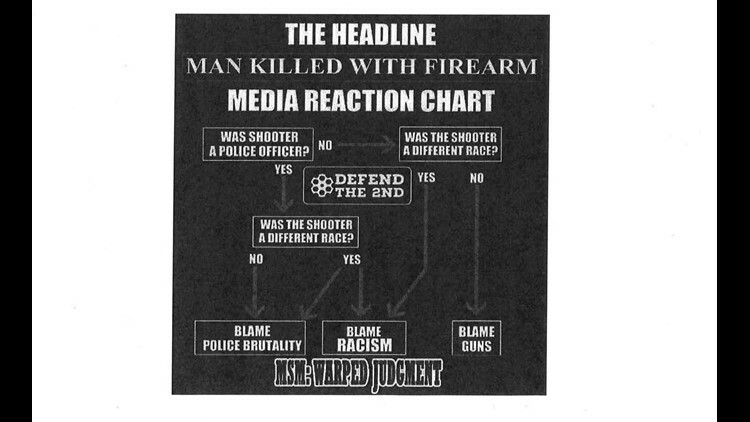 The simple infographic presented a provocative flow chart, one designed to enflame passions after tragic shootings. It was the work of a Russian conspiracy; a criminal enterprise the FBI and federal prosecutors said continues to this day. The Facebook post is one of eight images laid bare by federal authorities Friday. A criminal complaint charged one Russian resident with directing the finances used to create the divisive posts. Prosecutors said the malign influence campaign impacted the Washington, D.C. area, with the Russian team infiltrating an anti-Trump rally at the White House July 4, 2017. 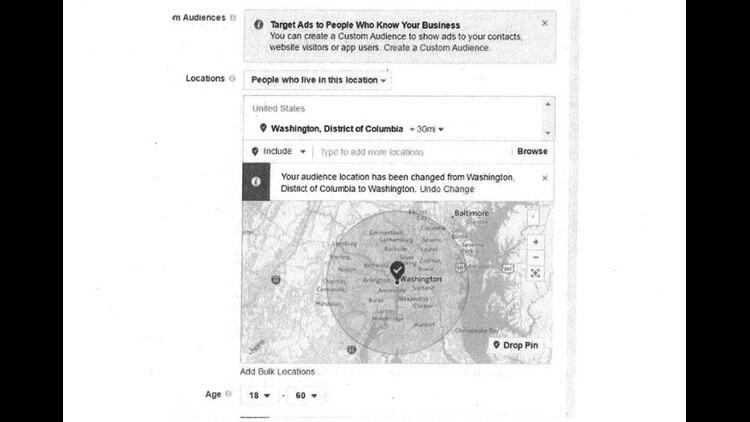 The group proposed buying Facebook ads to promote the protest, reaching up to 58,000 people within 30 miles of the nation’s capital. An unnamed American organization allowed the Russians to become a co-organizer of the event on Facebook, after the team made dubious overtures to the Americans. Using Facebook as its chief weapon, another post made under the pseudonym “Bertha Malone” exploited the crisis at the southern border. 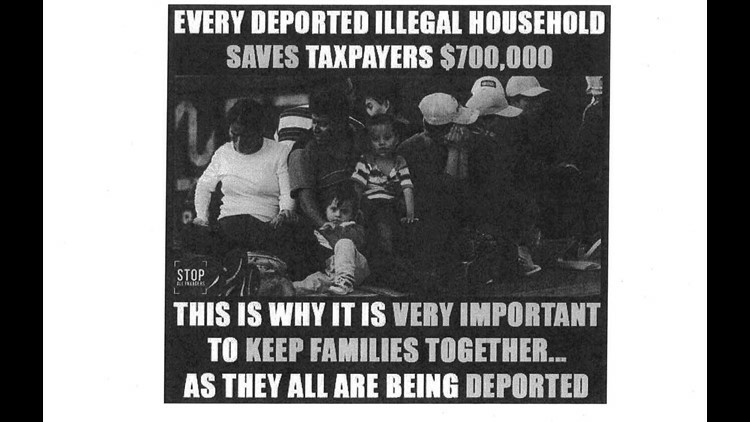 “Every deported illegal household saves taxpayers $700,000,” the post began. The conspiracy to spread fake and hateful social media posts is described in acute detail by FBI Special Agent David Holt, a specialist in foreign influence operations. According to the 39-page criminal complaint, Khusyaynova served as the chief accountant for the social media operation. Khusyaynova’s budget eventually skyrocketed to a stunning $35 million, with funds used to buy ads and analytics across the United States, the European Union and Ukraine. Prigozhin maintains close ties with the Russian President, after making his catering fortune feeding the Russian military and thousands of school children. American authorities alleged Prigozhin surreptitiously directed money from his catering companies to the social media operation. The FBI investigation uncovered aggressive and often racially ignorant guidance to Russians who were tasked with writing the posts. The goal of the written guidance was to provide a roadmap on how to offend and enrage. “Colored LGBT are less sophisticated than white; therefore, complicated phrases and messages do not work,” reads a translation from Russian text. A stated goal of the operation was to effectively aggravate the conflict between minorities and the rest of the population. The conspiracy also sought to spread articles from U.S. news outlets through Facebook, re-delivered to Americans with the most inflammatory spin possible. The criminal complaint is dated Sept. 28, 2018, and was unsealed as the nation's top law enforcement and intelligence agencies issued a warning against "ongoing campaigns by Russia, China and other foreign actors, including Iran, to undermine confidence in democratic institutions and influence public sentiment and government policies." "Elements of these campaigns," the statement said, "can take many forms, including social media to amplify divisive issues, sponsoring specific content in English-language media like RT and Sputnik, seeing disinformation through sympathetic spokespersons regarding political candidates and disseminating foreign propaganda." The rare joint statement, issued by the FBI, Office of the Director of National Intelligence, Department of Justice and Department of Homeland Security, noted there is no present evidence of a cyber-intrusion compromising American voting systems.